Here's a list of everything you must have to start working from home as a health coach. I use these essential resources to grow my home-based online business. Keep reading for details about the affordable resources I used to start my health coaching business and continue to use today to operate my practice. I initially invested about $5K to start my business and spend under $30 a month to maintain it. Entering a health coach training program is the first step to starting a health coaching business. I recommend Integrative Nutrition. I'm a graduate! During the Institute for Integrative Nutrition one year program, you will learn from inspiring leaders in the health and wellness industry as well as experts in business and marketing, connect with an amazing supportive community, and experience a remarkable personal transformation – all through a convenient online platform that makes learning on-the-go possible for anyone. Check out IIN's Curriculum Guide that goes into more detail on the curriculum and opportunities you’ll have as a practicing Health Coach. Check out a sample class too. Every business needs a website. Integrative Nutrition gives students a free website, but the default domain (web address/ URL) is long and hard to remember. You need to change it to an awesome domain name-- either your name or your business name-- so your ideal clients can find you and learn all about the benefits of working with a health coach. Get your domain name at any internet domain registrar company. I Googled "GoDaddy", clicked on an ad, and go the first year for just 99 cents! If I were you, I'd try the same thing to see if the promotion is still running. I now pay $15 a year (standard price) for the custom domain for my IIN health coach website with the same company. You'll need business cards to share with the awesome people (potential clients and referrals) you connect with at the health food store, yoga studio, coffee shop, doctor's office, and networking events. Integrative Nutrition grads get free business cards from Vistaprint but they're kinda generic and cheap looking. I use Moo.com to print full-color business cards that are professional, unique, and made with thick recycled paper. I love that Moo cards are made in the USA (Rhode Island represent!). I get so many compliments on my business cards, which feature my photo so people can remember who I am. Click here to get 10% off your first order at Moo. I use (and love) Acuity online appointment scheduling software to automate my client bookings, cancellations, reminders and payment. Acuity Scheduling makes it supereasy for clients to make an appointment or reschedule without playing phone tag. It syncs with your calendar so you don't have to worry about someone booking a consultation while you're out at vet appointment during what would be your regular office hours. I've tried several other scheduling software and Acuity is the absolute best! Try Acuity for free today. A newsletter is the best way to build a relationship with your target audience and convert leads to paying clients. I use and love Mailchimp because they make it easy to send a free gift to new subscribers; manage contacts; host challenges, cleanses, or programs; as well as design a professional looking newsletter without actually needing to be a professional. Sign up for Mailchimp for free. Even though most people will contact you online, it's still important to have a business phone. This way when a potential client gets your voicemail they'll hear "You've reached health coach [your name]." Super classy! You'll also be able to freely share your phone number on your website, business card, and other promotional mediums without worry of disclosing your home or personal cell number to weirdos. I also use my Skype Number to calls clients who don't use Skype over wifi using either my laptop or the Skype app. Tip: Invest in professional headphones with a good mic to minimize background noise and so that you're hands-free to take notes while on the phone with clients. You need a way to get paid. I use Paypal because it's easy to use, trusted worldwide, and has low fees. It integrates with my online appointment scheduler so I can collect money from clients in advance. I also created a Paypal subscription button for my website so that I can receive payments each month from clients enrolled in long-term coaching. With Paypal, I don't pay a monthly fee for my account. I only pay a few cents and a small percentage of each transaction. Running your own business isn't easy. It's a lot of hard work and, #realtalk, can sometimes be frustrating, overwhelming, and lonely. You need to be passionate about helping others and committed to being successful in order to endure. Love what you do so that you can make the world a healthier and happier place for yourself and others. 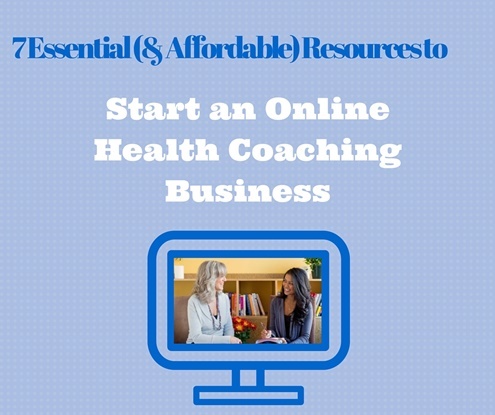 Are you a health coach or do you run another home-based business? Which of these resources do you use? What would you add to this list?